This interview is loosely transcribed from an in-class discussion at NYU with r. erica doyle on Monday August 13, 2015. The instructor of the course is Eileen Myles. Most questions in the interview were asked by students. In the transcription below, questions and answers are rearranged from how they originally appeared (in oration). 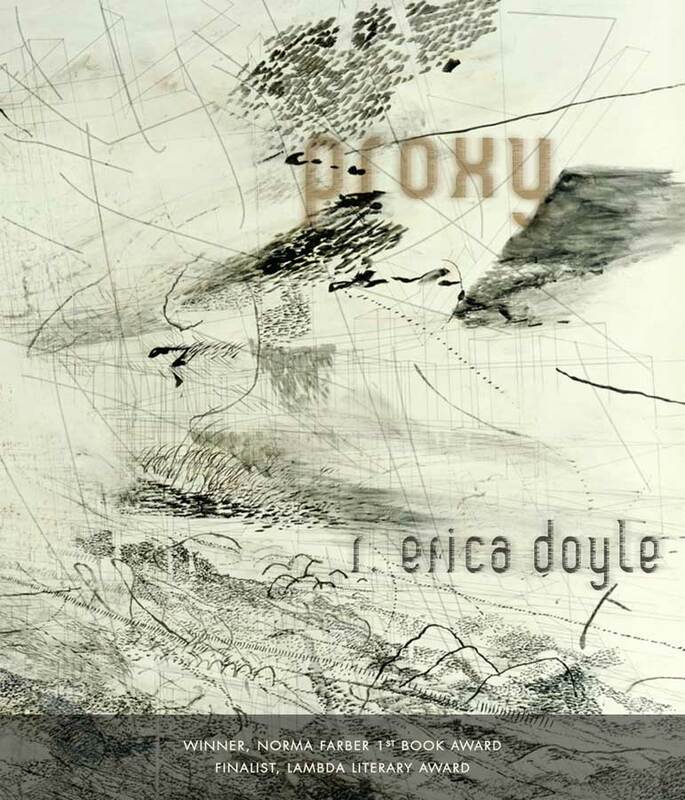 r. erica doyle is the author of proxy (Belladonna*, 2014). proxy was honored by the Poetry Society of America with the Norma Farber First Book Award. proxy was also a finalist for a Lambda Literary Award. r. erica doyle’s poetry and fiction appear in various journals, including Ploughshares, Callaloo, Bloom, From the Fishouse, Blithe House Quarterly and Sinister Wisdom. She is a Cave Canem fellow, born in Brooklyn to Trinidadian immigrant parents. [Proxy] is a very durable, moving, book that you’ve written. Do you have another book coming? Well, I’m that person that has multiple projects, so when I was sending [Proxy] out I also had two other manuscripts floating around that were newer. And now I have a bunch of even stuff that I’m working on still. I also write prose. I have a novel that I’m working on, essays, etc. So, yea I have a few other projects. Two are finished though. So I’m thinking that I’ll revisit them this summer and then we’ll see what happens. And they’re different; they’re really different from [Proxy]. How do you decide the form of your poems? This project started as a found poem from A Tour of the Calculus. That found poem has become the epigraphs in the book. I built everything else around that [found] poem. I started writing [Proxy] in 2001. The work really shifted [from the found poem] when I was living on Bleeker Street, when 9/11 happened, and taking an amazing workshop with Patricia Smith. She told us to write about something that’s taboo, to you. Not something that’s gunna shock my mother kind of taboo, but something that feels really fucked up to you… And that actually the genesis of this book… When I initially started writing this poem, it looked like one long stanza and then I backed away and started to chop at it and play with the pronouns. I was thinking about the position of the “you.” Sometimes the “you” felt like a prop to the speaker and sometimes the “you” felt so intimate. I was wondering who the “you” might be? Then sometimes, it actually means “us.” And one of the things that we talked about in the editing process, is what is the experience. How close is the experience of the reader in different parts of the book? And that was one of my organizing principles, as well as the journey. So it [proxy] became less linear and more about the vulnerability and intimacy. Can you tell us more about the placement of calculus in the poems? I’m actually a black geek. I’m really into sci-fi and fantasy. My mother was a scientist, she was an electrical engineer and so I’ve also been into scientifical explanations of the world. I was really interested in A Brief History of Time when it came out. I am constantly reading things like that by myself… So at the time [in 2001], I had started to read about mathematics and biographies of mathematicians more. Someone had then recommended A Tour of the Calculus to me and I was like, OH MY GOD THIS IS MY LIFE. So that’s when I said, okay, if I were to translate this language [from A Tour of the Calculus] into poetry. What would that look like? Because you know, mathematics is just another language. How did you decide what to cut or keep from your book? It was really about the strength of the language and the image. At one point I was teaching middle school in the Bronx and that started entering my work. But that does not belong in this book, those weird notes from the kids, all the things they would say. I would tell myself “Yes, this belongs in the books because it’s in the same style”. But it just wasn’t part of the integrity of the book. Those cuts were all edits that I had made, prior to having the book over to the publishers. This book had probably been around for about four years before reaching them… You know, sometimes you have lines that you like but you have to let them go. You can tell when it’s not part of the book… I had really spent a lot of time with this work and had pared it down. So I wasn’t enamored with keep work just because it was stylistically good, I had to consider how the whole manuscript fit together… As I got to be a better writer, I could start seeing what to cut. I really learned a lot from Dawn Lundy Martin, her economy. She is very economical with words, very careful, very deliberate. She edits as she writes. She would be writing and crossing out, writing and crossing out. She taught me how to be intentional and not to be so flippant. I’m wondering, did you write this as a chronicle [in order] or how did this process come about for you? So, it started as a chronicle and then transformed into something else. In the end, it is completely out of the order in which I wrote it. The sections really helped me manage the order and composition of the book, thinking of each section as an experience. At first, I started with five sections and then it became six. I was trying to make sure that everything inside each section fit, according to the experience which I was describing. It started chronologically but then it began to bifurcate. Then I ended up arranging it differently as a manuscript. Sometimes I’ll jump around and read the sections out of order. What are the influences for your book?